Calling all deer hunters! 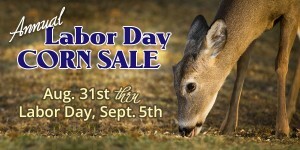 HUGE savings will happen again this year at Bar None Country Store during our annual Labor Day Corn Sale. 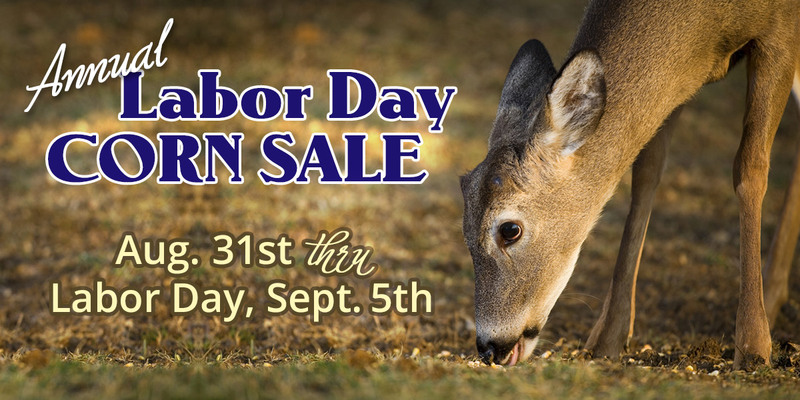 We are still working to finalize the details, sale prices and items that will be on sale, but we can tell you that deer corn will be on sale at a drastically low price! We’ll also have savings on buck draw, attractants, plot feed, wasp spray and more as well as a chance to enter and win gift cards. Our corn price will be announced a couple days before the sale begins. Keep a watch on our Facebook page for the most up to date info. The sale will start on Wednesday, August 31 and run thru Labor Day, Monday, September 5, 2016. This entry was posted on Wednesday, July 27th, 2016 at 7:27 pm	and is filed under Events, News & Updates, Specials, Wildlife, Wildlife, Deer. You can follow any responses to this entry through the RSS 2.0 feed. Both comments and pings are currently closed.